In a day filled with release date announcements from the streaming service, Netflix has just revealed that its upcoming animated series adaptation of the classic Dr. Seuss children’s book Green Eggs and Ham is set to debut in the fourth quarter of this year, according to Variety. Pitch Perfect alum Adam Devine and Academy Award winner Michael Douglas (Wall Street) are set to lead the cast as the voices of Sam I am and Guy Am I, respectively. Check out the show’s first teaser below! 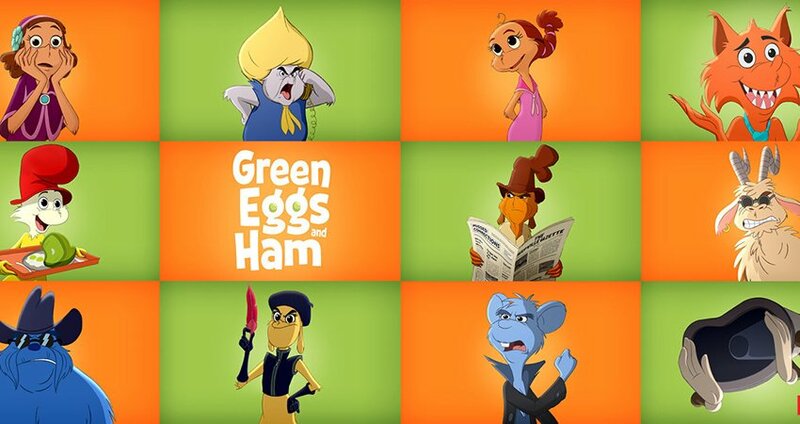 Green Eggs and Ham will also be featuring the voices of Ilana Grazer (Rough Night), Oscar winner Diane Keaton (Annie Hall), Eddie Izzard (The Lego Batman Movie), Tracy Morgan (30 Rock), Keegan-Michael Key (Key & Peele), Jeffrey Wright (Westworld), Jillian Bell (Goosebumps), John Turturro (Transformers) and Daveed Diggs (Hamilton). “The story of Green Eggs and Ham is like a postmodern Plains, Trains and Automobiles through the whimsical world of Dr. Seuss. Sam rescues the rare Chickeraffe from the Glurfsburg Zoo, hides it in a briefcase, and attempts to make his way to Meepville where he can charter a cold air balloon to take the Chickeraffe to his island home. Guy just flopped his last big chance at being a world famous inventor for the industrial Snerz Co. He packs up his invention in a briefcase and resigns to give up on his dreams and become a paint watcher. A chance meeting at a diner with Sam, and a switch up with the briefcases results in these two unlikely souls getting mixed up on an adventure that takes them on a journey of self discovery. Based on the classic global best-selling book by Dr. Seuss (Theodor Seuss Geisel), “Green Eggs and Ham” will be adapted for television by Jared Stern (The LEGO Movie Sequel), who will also serve as executive producer alongside Ellen DeGeneres, Jeff Kleeman, Mike Karz and David Dobkin. The animated family comedy is from A Very Good Production, A Stern Talking To and Gulfstream Television in association with Warner Bros Animation, and distributed by Warner Bros. Television. The animated series is set to premiere this fall, exclusively on Netflix.